Hello everyone! 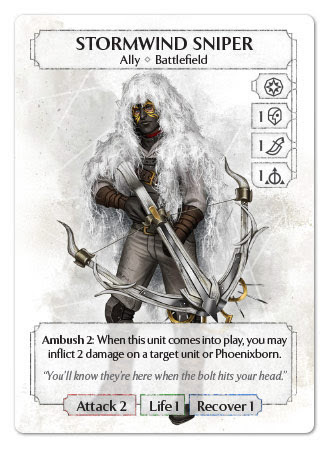 In the last few episodes of my Ashes Basics series, we dealt with the Phoenixborn in the Core Set and with their preconstructed deck. 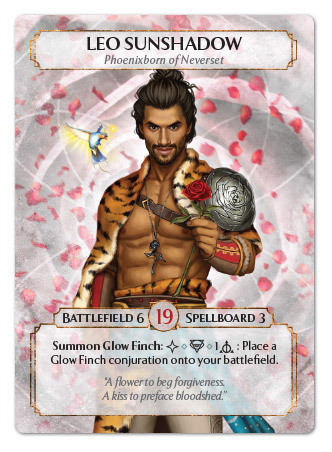 Before we begin addressing the expansions, though, I’d like to talk about deckbilding, because attempting to build and play with a customized deck is a step that, in my opinion, anyone, even who didn’t have any previous experience with this kind of games, might want to take sooner or later. If you are here to discover the secrets behind building a tournament-winning super-deck, I’m sorry, I don’t have the magical recipe for you; but at least I hope to provide you some principles that – still in my opinion – you should always keep in mind when building a deck. Choose exactly 10 dice to form your pool. There are no limitations in the types and distribution of the chosen dice. Conjurations are not included in the deck, but in a conjuration pile that is created by taking all the conjuration that the cards in your deck could potentially bring into play. Each card will be included in the conjuration pile in a number of copies equal to its conjuration limit. Great. Done. That’s all. Next time we’ll begin to talk about the expansion decks. Thanks for reading! See ya! Ok… fine, that’s not everything. Well… yes, from a certain point of view it is all, these are the rules. With these simple rules, and the cards in the Core Set, you can create a myriad of decks, so have fun! Truth is, among all the possible combinations, a lot would be completely unplayable, and among the playable one, some will be more efficient than others. The purpose of this article is to give you some general criteria to narrow the field and allow you to dedicate only to those combination that could seriously work. Disclaimer: I listed the following steps in a somewhat logical order, that is the one I usually follow, but that doesn’t mean you should follow this to the letter. Actually, you’ll most likely find yourself jumping back and forth between those steps in an iterative way, adjusting your choices again and again and reviewing what you already decided, polishing your deck until you reach a satisfactory point. Let’s start with the basics. Game objective? To win. How do you win? 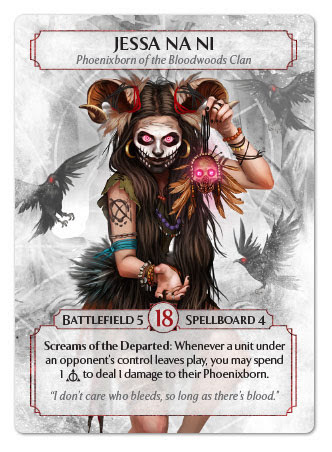 By putting as many wound tokens on the opponent Phoenixborn as they have Life. That’s your deck’s task. 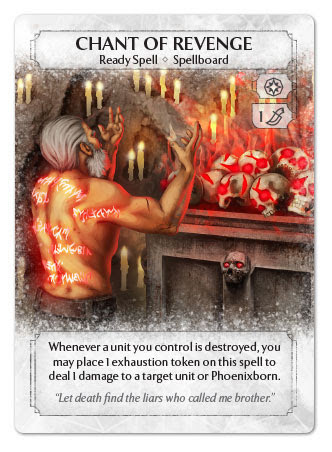 There are no other ways to win other than dealing 15-22 wounds on the enemy Phoenixborn and make them stay there, so the first question you have to ask yourself is: how do I fulfil this objective? 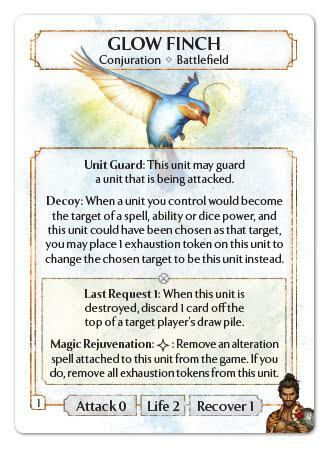 Repeatedly attack the opponent’s Phoenixborn with many small units, in succession or as a group. Let the opponent’s Phoenixborn suffer damage because their controller can’t draw in the Prepare Phase. Those strategies aren’t “absolute” of course. On the contrary, since each offers advantages and disadvantages, they could be combined in varios ratios to gain more flexibility and to mitigate your weak points. For example, you would want to use a mix of large and small units, or you would combine the capability to inflict direct damage with discard, to reduce the number of rounds you need to win thanks to the damage for not being able to draw. Once you set your broad strategy, you should choose a “package” of core cards that would allow you to lead that strategy to completion. You want to use swarms of small units? 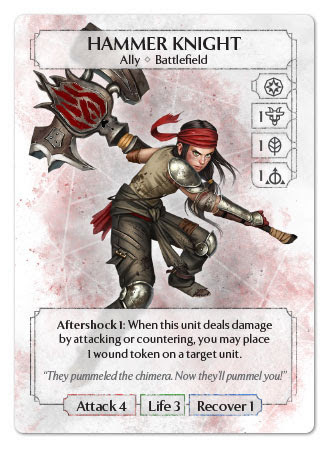 Maybe units like Gilder, Mist Spirit, Shadow Spirit, Fire Archer or Sleeping Widows could do the job. Direct damage? You would most likely consider cards as Molten Gold, Sympathy Pain or Stormwind Sniper. 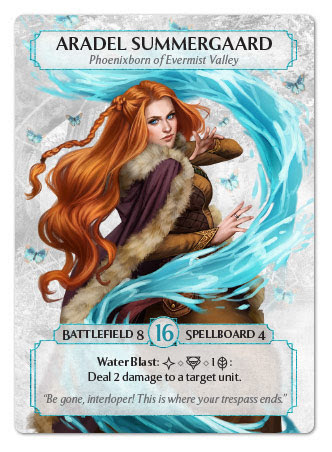 The Phoenixbonrn could be one of these core cards, but it’s not mandatory: you could choose a Phoenixborn only to support your chosen strategy, there’s nothing bad in that. 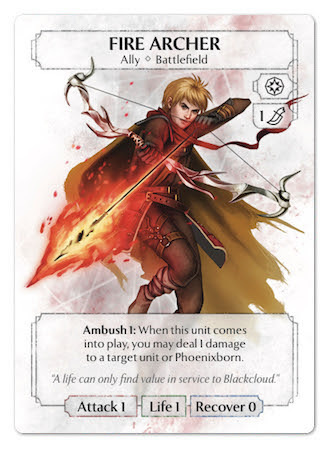 In picking your Phoenixborn, take into account the exclusive card you’ll gain access to: if that allows you to further advance your strategy, considering to use it makes sense, otherwise you could well do without. 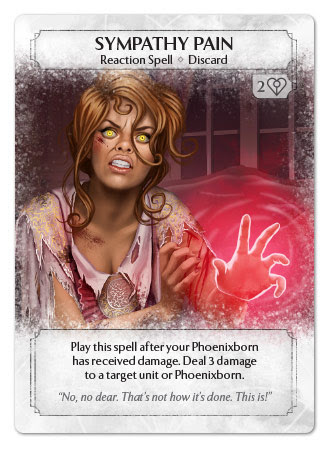 There are obviously cases where you would only want to use a given Phoenixborn precisely to have access to its unique card. 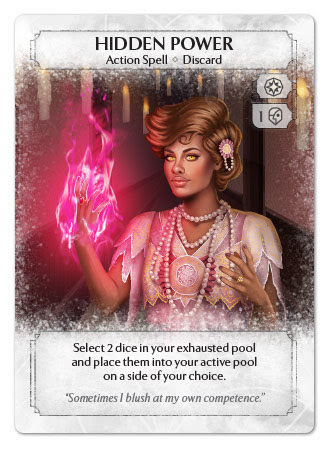 In such situations, in my opinion, you should attempt to choose a strategy to which your Phoenixborn could at least give a minimum of support, or you would find yourself with a card of limited utility in play. Once your strategy is set, and you chose the core cards around which your deck would be played, you should start to take a look at what kind of dice those cards will require, to understand which could be your (approximate) dice distribution. Don’t worry to choose exactly which and how many dice of each type to use, that’s something we’ll get back later at, but theoretically you should have, from just the core cards and your Phoenixborn, a rough idea of which types of dice you’ll mostly need, and which would act as a support or would most likely be cut, which would help you narrow the field of cards you could add to support the deck’s strategy. If, for instance, you would want to create your strategy around launching unblockable attacks with a Hammer Knight and Hypnotize, you would need at least a Nature, a Ceremonial, two Charm, and a fifth die to set this up in a single round. 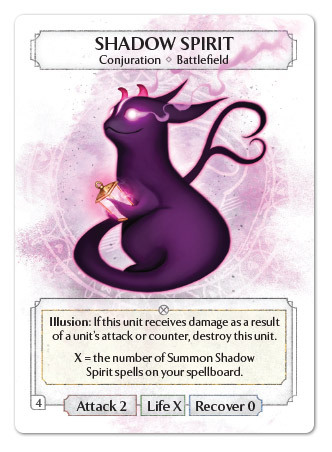 As a precaution, both to limit meditation and as a countermeasure against Illusion dice, having at least another die of each kind is never a good idea, so your strategy could force you to commit at least 7 of your ten dice: 2 2 3 , which most likely mean Summon Shadow Hound (costing 3 ) won’t be a fitting addition – unless you go heavy with dice recovery – while Summon Gilder (play cost 1 , activation cost 1 ) could find some room more easily, and could be a good support card to protect your Hammer Knight. A question you could often find yourself asking, especially at the beginning, would be: how may dice types to use? The short answer is: it depends on which cards you are using. Contrary to what happens in other games that require specific resources to play given cards, having all the resources available from the beginning allows you to include a broader array of options; you’ll rarely run the risk of having a given resource available and not drawing cards that require it, or – much worse – having specific cards in hand that you can’t play because you lack the corresponding resources. This said, the ideal approach is to go for 2-3 magic types. Even with the “mono-magic” expansions, the card pool is at the moment too narrow to build truly efficient single-die decks especially because of the predictability of the cards you’ll have to use, and the excessive specialization that would lead you to have many weak points in other areas, which more versatile opponents would easily exploit (though you definitely won’t have any problems in finding the right resources at the right time). On the opposite side, diluting the dice distribution over all the 4 types, though feasible, would make managing your deck more complex, and would make you an easier prey for the Hungry Wolves (i.e. Illusion dice). For 3 kinds of dice: 4/3/3 (balanced), 4/4/2 (balanced, with a “splash” of one type – one of the most common distributions), 5/3/2, or 6/2/2 (growing emphasis on one of the three magic types). I wrote “and/or” because frequently those aspects overlap, and the same card can cover more functions at the same time. 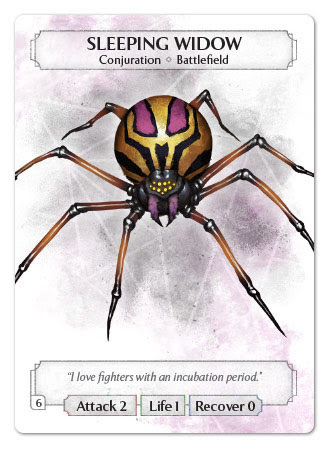 For instance, if you wanted to enact a “swarm” strategy, cards like Final Cry or Chant of Revenge could show some utility though they don’t directly advance your strategy of putting a lot of cheap units into play and attack the opponent. An overall weakness of this strategy is the fact that such units tend to be extremely frail and will be destroyed with ease: having cards that, with a moderate expense, allow you to transform the loss of units into damage to the opponent is a good help for sure. 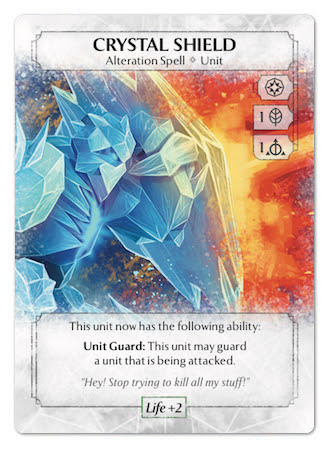 Or, if you want to go for strong but expensive units, Rin’s Fury and Hypnosis can both make this strategy easier, giving you extra dice to play those units and the upgrades you need, and a way to directly attack the opponent, but also mitigate some of the deck’s limitations, like the generally high cost of larger units, and the fact the opponent can easily block those units with smaller, cheaper ones, making you waste precious resources. In general, even if you aim for direct damage or to discard the opponent’s deck, it’s good to have a way to constantly bring units into play, both to attack and to defend. Ready spells that put conjuration into your battlefield are the most obvious choice, but they are slow and predictable, while allies deal more damage on average, and allow you to put some pressure to your opponent and to somewhat exploit a “surprise effect”, but require to be drawn, and the cost for you to recover them from the discard pile might turn out to be quite steep. 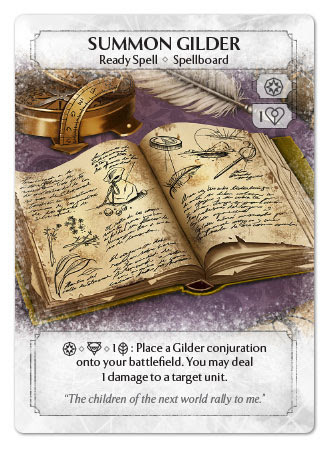 Once you have chosen your strategy, you should think about how to implement it, and about when, during the game, you could be in need of a given card: this might help you to understand how many copies to use. A cart that can help you set the course in the first round, but won’t be of much use if drawn later will probably be enough in a single copy, to include in your First Five. On the other hand, if you want to maximize the chances to see a card you don’t immediately need, but becomes fundamental from round 2 onward, you should include three copies of it. You should evaluate, based on the average cost on the cards in your deck and the number of drawing effects you have, how many cards you might draw each round, because this will influence the chances you have to see exactly that card you need a lot: if your costs are high, you’ll most likely play less cards per round from your hand, thus drawing less. 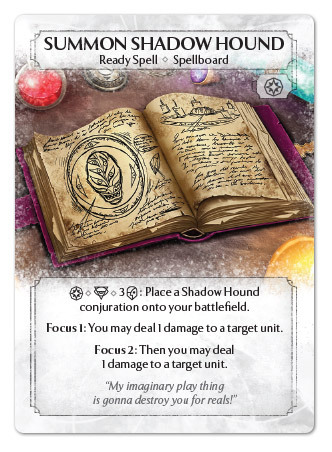 The same goes if you rely much on ready spells in your spellboard and on those cards that require you to spend dice to activate their abilities. On the other hand, cheap spells and allies in hand will lead you to save very few cards from round to round (with the opposite risk, that’s finding yourselves with a lot of unspent dice, beware!) and so drawing a lot, increasing the chances to see the cards you need. Last, always take into account the fact that, even if you don’t draw cards that require a given type of magic, you always have access to the dice powers, whose efficiency may vary a lot based on the situation ( and have a broader utility, and are a bit more situational), but it’s never to be underestimated. Another fundamental aspect is the choice of the First Five you’re going to usually play with, which is something that usually happens when defining the key cards for your strategy. 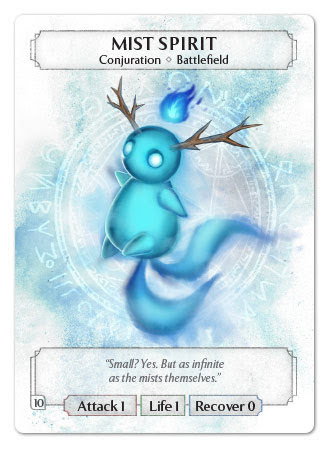 This won’t automatically mean your First Five must all be key cards: it’s possible, especially if you aim for a long match, that the majority of those will stay in the deck, and the First Five will serve to set up a first round that allows you to mitigate the damage and initiate a strategy that will develop in the following rounds. 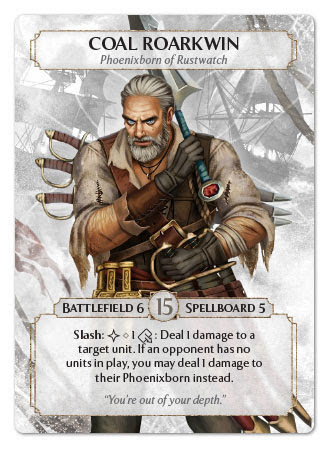 Anyway, however you want to call it, the Thunder Number is a fundamental concept for the Ashes gameplay and strategy, thus I invite you, if you didn’t already do it, to read Christopher “Papa” Pratt’s Hidden Power article, which addresses the topic much better than I could ever do. 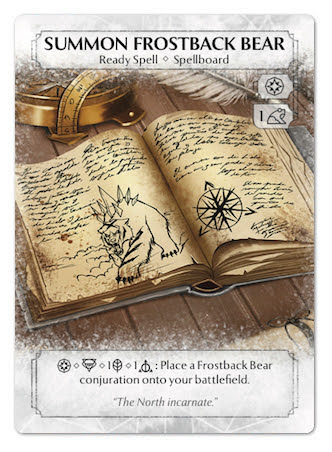 What do I do if the opponent opens with Hammer Knight + Frostback Bear and goes directly at my throat? How can I stop such an attack? How do I react to an opponent who tries to slow down my game by exhausting my dice and cards, or forcing me to fill up battlefield slots with unusable stuff? How do I protect cards that are fundamental for my strategy and prevent them from being blocked, discarded or more in general made useless by my opponent? How do I create a breach in the defenses of an opponent who hides between a wall of units? 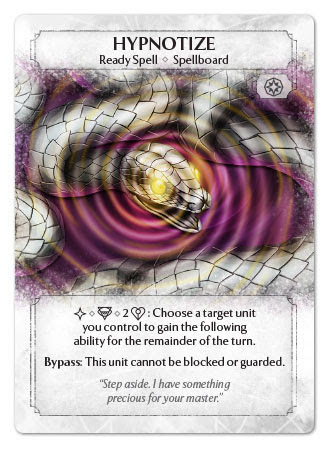 The answer to these questions will vary a lot depending on which cards you chose, and on how significant is the threat posed by this or that strategy. 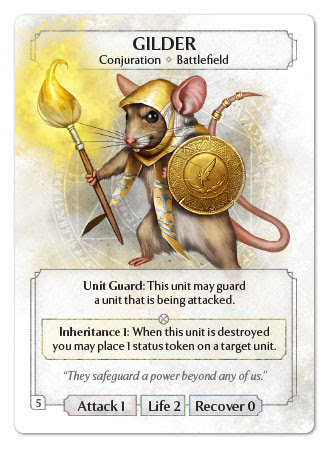 Consider this a sort of costs-to-benefits analysis: how big is the risk to ignore this or that card/ability/effect? How much do I spend, in terms of resources and advancement of my win condition, to prevent that? Unfortunately, you can’t prevent every risk, on the contrary, this may be counter-productive, as you might find yourself with a deck full of answers to issues that will not materialize. Each of those cards will remove oxygen from your strategy, which has the sole purpose of doing damage to the opposing Phoenixborn. 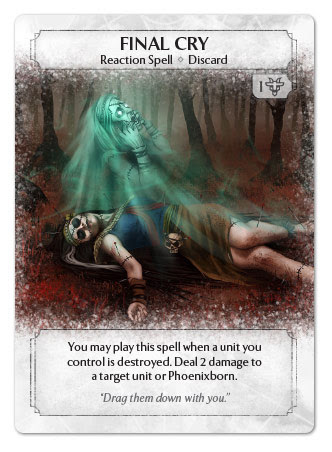 Not exhausting their units, nor cancelling their abilities, nor removing from play their alteration spells: those should only be means that allow the other cards in your deck to fulfil your main objective of destroying the opponent’s Phoenixborn, they should never replace it. To be true, in some cases the answer to a potential threat could be, to quote the proud hierarch Gaetano Maria Barbagli, a sound “I don’t care!” followed by a meaner counter attack on the opponent’s forces. 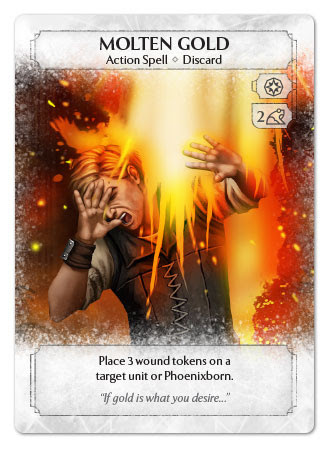 The evaluations made above should always integrate with the choice of the First Five: the more your starting hand is “locked”, the less room you’ll have to deal with threats from your opponents’ decks, so is usually a advisable to keep at least one “flexible” pick, to make at the beginning of the game, after seeing the opponent’s Phoenixborn and (following competitive rules) dice. 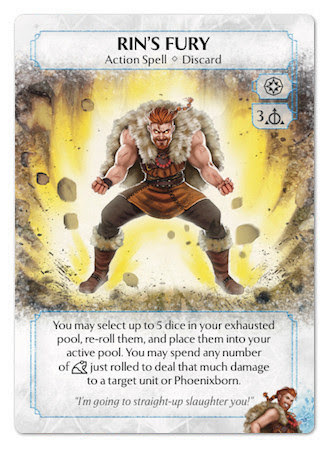 Some choices can be quite obvious: if you see a bunch of Illusion dice, keeping your Thunder Number low and not relying much on cards which require power symbols is probably a good idea, while if your opponent shows 4 and 4 expect an aggressive start, which could most likely feature a Hammer Knights and/or Frostback Bear. Other considerations will be harder to make, and depend a lot on how much you know your about your opponents’ play style, but just on the Phoenixborn they chose you can already expect a kind of gameplay: relying of frail units against Coal or Aradel is quite risky, the same goes with putting a lot of resources in a single big unit against Jessa, while if you see Leo across the board, you should take into account the incredible annoyance posed by his Glow Finch. Right, because you’ll most likely find yourselves with more than the 30 mandatory cards. A few, let’s say 3-4 extra cards, is fine. 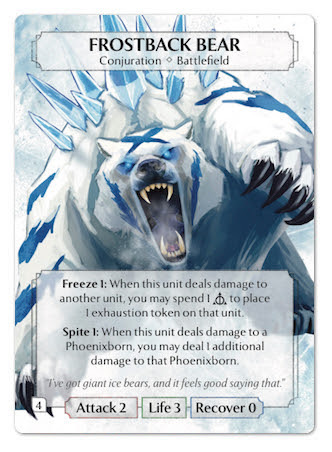 It usually means smoothing the deck to cut a copy here and one there, evaluating the implication of each modification one by one: Do I risk not having enough units by cutting a Summon Frostback Bear? Do I really need three copies of Molten Gold or are two enough? If you find yourselves with 35+ cards in the deck, however, you’ll probably have to be much more heavy-handed, retrace your steps and thoroughly evaluate if one or more cards are really that necessary, until you have just a few cards in excess of the required 30, so that you can then polish and refine your deck. Ok, now here we are. The deck is over, at last!. 1 Phoenixborn, 30 cards, 3 copies of each max, the respective conjurations, and 10 dice. Now deckbuilding is over, and we can finally play. Well, actually this is true up to a certain point. Technically, yes, deckbuilding is complete and you have a ready-to-play deck, but is it efficient? Does it manage to realize the strategy you wanted to use? Is is satisfactory to play? Since no plan survives first contact with the enemy, there’s only a way to find out: play, play, play. When you test a new deck, pay attention to each and every detail: which cards you tend to use and which you don’t, whether the dice at your disposal are the right ones to play everything you need in every situation, or if you often find yourselves thinking “ah, if I had that card now…” or “one more Nature die would have been useful here”. Do you often find yourselves with unspent dice? Maybe your costs are too low, or you have too many resource-generating cards you don’t really need that much. You jump-start, but then after 2 rounds you can’t deal any more damage and lose in the long run? Maybe you are not applying the right pressure onto your opponent, and you need something to put them in a tight spot more frequently. Don’t underestimate any aspect, and train to analyze any game situation with critical eye. Do not stop at a single game, try the deck repeatedly, against different opponents, to evaluate which kinds of deck give you a hard time, and which ones you can beat with ease, but play also against the same deck, adjusting the strategy from time to time to understand in which measure the final outcome depends on the deck construction and in which on the way you play. After the match, think about what you did good and what you could have done better. What would have changed if you chose this card instead of that in the First Five? Were there any cards you realize you didn’t have the chance or the desire to play or, worse, when you drew them, you wished you didn’t? 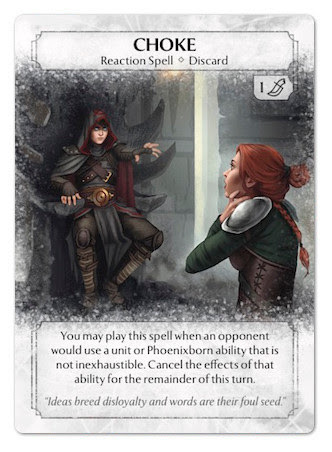 Reverse your point of view: don’t be afraid to talk with your opponent in an attempt to understand what they found an issue to deal with in your deck, or which situation they would have a hard time with, if you just did this move instead of that. The Ashes community is full of great people that are more than eager to discuss in a constructive way and provide advice and opinions. The more info you get, the better you could adjust your deck, especially when approaching an important event like a tournament. An useful advice – not an idea of my own, it was hinted some time ago in an episode of The Main Action Podcast as something used by Erik Rodriguez and Christopher “Papa” Pratt to prepare for the Tulsa tournament, but since it’s a wonderful idea I think is right to post it here – is that of trying your First Five, repeatedly playing the first round, and then resetting the game, choosing your starting hand each time. This will allow you to understand if you have a solid opening, and if there’s something you could improve in the first, crucial, phases of the game. Remember that a good opening won’t make you automatically win, but if you start bad, you’ll have a high chance to lose. Repeat the above steps iteratively, further refining your deck until you reach absolute perfection! That’s all. I hope my advice would turn out to be useful, and allow you to build decks that, if not efficient, are at least satisfying to play. Because if it’s true that the object of an Ashes match is to defeat the opponent’s Phoenixborn, the purpose of playing Ashes is (as with any other game) to have fun, so whatever deck you may want to use, whatever strategy you wish to follow, the first and most important question you always have to ask is: will I have fun in playing this deck?